The year-ending BBK Masters tournament starts in Tolosa on Monday, but Patxi Ruiz will not be present. The defender from Estella injured his hand on Sunday in a match in his home town. His place will be taken by Asier Olaizola who opens the competition with his match against Aritz Begino. Yesterday, Saturday 24th October, saw two matches in the second round of the Cuatro y Medio Championship, resulting in a victory apiece for the two empresas. In Amorebieta, Julen Retegi got the better of Patxi Ruiz 22-15 in an error strewn encounter. Retegi made five errors but played well, especially in defence, and manipulated Ruiz with ease. Ruiz for his part committed ten errors and as a result was never in the game. This must come as a huge disappointment for the man from Estella, who was clearly delighted to have come through his first round match with no sign of his long standing back injury. Retegi will play defending champion Aimar Olaizola in the quarter finals next weekend. Meanwhile, things were tight in Pamplona, where Oinatz Bengoetxea defeated Aritz Lasa 22-19. It was an intense, 70 minute encounter which could have gone either way, but the former Manomanista champion, who showed great strength in both attack and defence, held his nerve at the last. Bengoetxea will face Juan Martinez de Irujo next weekend for a place in the semi finals. Patxi Ruiz became the final pelotari to qualify for the second round of the Cuatro y Medio championship on Monday when he easily defeated Alberto Ongay in Tolosa. The defender from Estella has struggled for many months with a back injury and the doubts over his match fitness linger but if afflicted here he did not show it. He did not play in any of the festival tournaments in the summer and the rest looks to have done him the world of good. Ruiz looked the epitome of comfortable while his opponent seemed besieged with nerves from the outset, his feet rooted to the spot as Ruiz manoeuvered the ball at will. Ongay committed half a dozen errors in the course of the match, balanced by only one winner. His decision making was weak and his service wayward, and his body language told the story of the match. The rampant Ruiz fired eight winners in a victory for experience and nerve, and will now face Retegi Bi in Amorebieta on Saturday for a place in the quarter finals, where Olaizola II will await. It took defending champion Oinatz Bengoetxea just over half an hour to defeat Patxi Ruiz in this quarter final match, the first test in his title defence. The 24 year old had talked a good game earlier this week and delivered on all fronts against an opponent who was not himself. Some journalists had likened Patxi Ruiz to a broken record, such was his insistence on talking about his physical woes but on this showing, the 2003 champion was not crying wolf. As reported by Diario Vasco, some spectators were unhappy at shelling out their precious cash to watch a player who arguably should not have been on the court. One stated that “it is unacceptable to pay 40 euros to see Patxi Ruiz play under these conditions…Patxi suffered…but I too suffered at seeing him”. Ruiz, who played with strapping on his back, was simply unable to move as he needed, which was particularly obvious when he tried to bend. It was a night this great servant of the game will want to erase from his memory. Despite Patxi’s obvious affliction, it would be churlish to ignore the prowess displayed by Bengoetxea. It is always difficult to play a wounded rival but to his credit, the defending champion was utterly professional, both in his play and his demeanour. He took no risks, hardly employing his fearsome right handed sotomano, but had little need to. He overwhelmed Patxi with his strength and accuracy, served excellently, and showed impressive spark with his right, which bodes well for the challenges to come. For his part, the native of Leitza declared himself satisfied with his important first victory and his form but warned that more challenging rivals will await. He knew then that he would face either Sebastian Gonzalez or Juan Martinez de Irujo in his semi final on 17th May and he now knows that he will face the latter, who today triumphed 22-16. A harder challenge indeed. Scoring sequence: 1-0, 1-1, 9-1, 9-3, 15-3, 15-4 and 22-4. The first of the third round matches saw the entry of the first former champion. 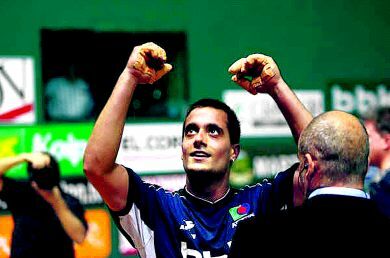 Patxi Ruiz won the Manomanista Championship in 2003, beating an injury afflicted Aimar Olaizola in the final. In order to progress into the latter stages of this year’s competition, the Navarrese defender will have to overcome injury troubles of his own. This very week, he informed the world, through the medium of Radio Euskadi, that he is not sure how much longer his back, which was operated upon in the autumn, will allow him to continue in the sport. He even went as far as to say that he had only entered this championship for the sake of his empresa. What sort of Patxi Ruiz, we wondered, would be on show in Amorebieta on Friday night? In his path stood the 28 year old Bizkaian Inigo Leiza, whose only manomanista triumph came in the second division championship in 2005. Leiza appeared to be in good form, having defeated Berasaluze IX last week, a player who himself has seemed on fire of late. However, in a topsy turvy match, it was Patxi who would overcome. The early exchanges were all about Patxi Ruiz, who appeared a changed man from the player who, along with Asier Olaizola, propped up the table in the recent Pairs Championship. There, the pelotari from Estella seemed constantly out of his depth and never found any rhythm or confidence. Although the first point in this encounter went to Leiza, Patxi stamped his authority in the course of the next six, his serve and volley working to perfection. His opponent on the other hand looked ill at ease, his three errors coming as a direct result of the pressure exerted by his rival. However, it was not to be one way traffic and Leiza did find his touch. The turning point came in the play which took the score to 2-6; Patxi Ruiz pulled off two excellent saves in defence but could not prevent Leiza from playing him like a puppet on a string. As he dived, Leiza sent the ball spiralling over his head. Leiza went on to take the next five points, aided by three misses on the part of Patxi and two volley winners of his own. With the score tied at 7-7, the crowd, who were mostly rather subdued, sensed a fight and warmed to the occasion. However, the latent class of Patxi Ruiz began to tell and the former champion, solid rather than flashy, began to build a lead. As the score crept from 7-7 to 12-7, Patxi ground his opponent into the floor in the style of a master accumulator rather than going for the knockout punch, though there was no doubt as to who was the superior player. Patxi displayed strength in closing out points with a beautifully judged drop and a driven volley which confused Leiza to the extent that he did not even chase it, but his greatest strength was in forcing his rival to crack. This was nowhere more obvious than in the point which took the score to 9-7, in which he repeatedly pushed Leiza back, mercilessly testing his overhead volleying power until he could take it no more. Leiza did find the power to retaliate but his comeback attempt fell short of achieving parity with his opponent and in reality, Patxi never looked like a loser. As he carried on in the same vein of consistency, Leiza looked like a man who knew he was in for a beating. The errors became more numerous and as he hit high, miscued, and sometimes missed altogether, Patxi bossed the closing points with abandon, tying his opponent to the frontis before daring him to fetch balls for which he had to hare backwards in hopeless desperation. Leiza managed to accumulate a handful of points, more through Patxi’s carelessness than his own skill. So, it is the 2003 victor who progresses to the next round, where he will face the formidable obstacle of defending champion Oinatz Bengoetxea, who showed good form in the curtain raising doubles match which preceded this manomanista encounter. There was little sign in the course of the play of discomfort caused by Patxi’s back, but he did use the rest periods to stretch, indicating that the problem is very much a reality. Only time will tell how much of an onslaught he can withstand, for there will surely be tougher tests ahead. Scoring sequence: 0-1, 1-1, 6-1, 6-7, 7-7, 12-7, 12-8, 12-11, 15-11, 15-12, 18-12, 18-13 and 22-13. The final scoreboard tells us that Asier Olaizola and Patxi Ruiz lost once again at Beotibar on Monday. This in itself was hardly important, or startling, news. However, the result of this match meant so much more and a seemigly pointless encounter between two pairs, already eliminated from the championship, took on the status of one of the strangtest and most important matches of the year so far. The fate of two couples, Bengoetxea VI/Beloki of Asegarce and Gonzalez/Barriola of Aspe hung on this evening; a Xala/Zubieta win would see the former qualify for the semi finals and an Olaizola I/Patxi Ruiz win would see the latter pair go through. Whatever happened, a win for either side would result in elimination for a pair from their own empresa. Certain elements of the press spent the week discussing the potential ramifications of this situation; could either pair be tempted to play at ‘worse than their best’ for the good of their own empresa? In the end however, fair play was the only sporting option and there was nothing remotely suspect about the outcome as Asier and Patxi were once again outplayed by a better pair. Xala and Zubieta have won their last three matches in commanding style and Monday was no different. Xala must consider himself unlucky to be leaving the tournament at this stage given the recent exalted level of his play. Despite being one of the players of the competition, he has never quite had the defender to back him up and head to head record against the other pairs in contention was his undoing in the finals standings. He did however bid farewell with a flourish to which Asier Olaizola, who gave everything he could muster, had no answer. Zubieta, on this occasion, supported him consumately, outplaying Patxi Ruiz with ease. And so, Oinatz Bengoetxea and Ruben Beloki will be back for more as the championship moves into the semi final stage. 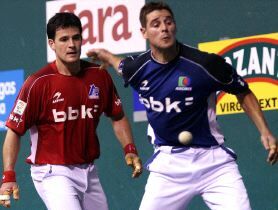 Gonzalez and Barriola suffer from Asier and Patxi’s failure to perform and leave the competition. They will be joined in the next stage by defending champions Olaizola II and Mendizabal II, Martinez de Irujo and Goni III, and Berasaluze VIII and Begino.